There’s no better week of the year to be making this “super-delicious” supper for two, said Wesley Avila in Guerrilla Tacos: Recipes From the Streets of L.A. (Ten Speed Press). Turkey necks are sitting in the fridges of many people you know, and let’s be honest, those folks “ain’t gonna do nothing” with them. Our taco trucks use duck fat to confit, but lard works, too. Just let the necks cook all day, and load the shredded meat, tomatillo salsa, and cilantro into the best flour tortillas you can find. If your friends don’t have turkey necks, your b utcher will. Preheat oven to 225. In a small pot, warm fat until just liquid. Rinse necks under cold running water. Pat dry; season liberally with salt and pepper. In a 12-inch cast-iron skillet, lay necks flat, with thyme, peppercorns, and 2 peeled garlic cloves. Cover with duck fat; transfer to oven; roast at least 8 hours. Take skillet from oven. Remove necks and allow to drain and cool on a grate. Discard garlic, thyme, and peppercorns and pour off all but 2 tbsp of fat. Pick all meat from cooled necks, using your hands. Add vegetable oil to fat in skillet. Place skillet over medium-high heat, add onion, and sauté until translucent, about 3 minutes, then add 3 cloves sliced garlic. When garlic is just aromatic, add jalapeño, tomatoes, bay leaves, 1 cup cilantro, and cumin. Season with salt and pepper; cook until tomatoes are very soft. Add turkey and sauté, stirring, until heated through. Leave over heat, without stirring, another 2 or 3 minutes, until turkey is slightly crisp. Season with salt and pepper; discard bay leaves. 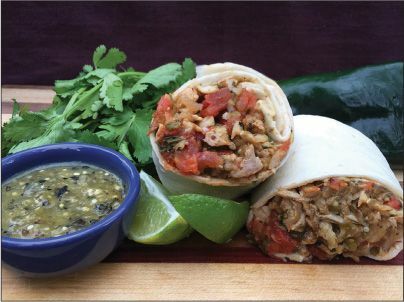 Spoon onto tortillas, add salsa (recipe below), and garnish with 1 cup chopped cilantro. Roll up burritos and enjoy. Serves 2.